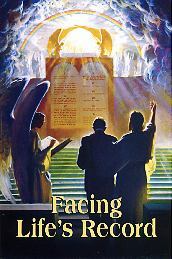 The Facing Life's Record magazine has the text of a chapter by the same title in the book, The Great Controversy. The message is one of judgment . . . and mercy. To read this magazine online in HTML format, please click here. ...or for a PDF file, try this. Note: The "Facing Life's Record" magazine in printed form is 16 pages, approx. 6.3" x 9".